Free Spirit Publishing, 9781575423692, 24pp. “Look at those feet! Aren’t they sweet?” Yes—when they’re walking, standing, leaping, and landing. And when they’re kicking balls or leaves. But not when they’re kicking people! In simple words and charming full-color illustrations, this bilingual English-Spanish book helps toddlers learn to use their feet for fun, not in anger or frustration. It also includes tips for parents and caregivers in both languages on how to help toddlers be sweet with their feet. 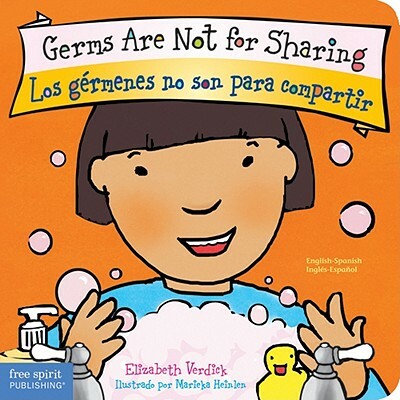 Elizabeth Verdick is the author of more than thirty highly acclaimed books for children and teenagers, including books in the Toddler Tools™ board book series, the Best Behavior series for young children, and the Laugh & Learn™ series for preteens. Her most recent titles include Bedtime and Calm-Down Time from the Toddler Tools series and Don’t Behave Like You Live in a Cave from the Laugh & Learn series. Elizabeth’s daughter and son are the inspiration for nearly everything she writes. She lives with her husband, two children, and five pets near St. Paul, Minnesota. Marieka Heinlen received her BFA at the University of Wisconsin, Madison, and also studied at Central Saint Martins College of Art and Design in London. She launched her career as an award-winning children’s book illustrator with the original edition of Hands Are Not for Hitting and has illustrated all of the books in the Best Behavior and Toddler Tools series. As a freelance illustrator and designer, Marieka focuses her work on books and other materials for children, teens, parents, and teachers. She lives in St. Paul, Minnesota, with her husband, son, and daughter.